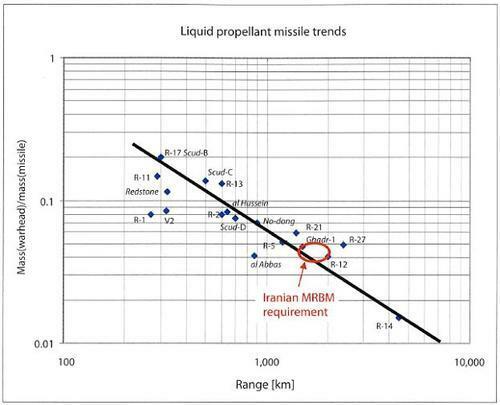 The first chapter of the IISS report on Iran’s missile program contains a graph (reproduced below) showing data on missile capabilities as a function of missile range. In particular, it looks at historical trends in single-stage, liquid-fueled missiles with ranges from less than 300 km to nearly 5,000 km, and plots the ratio of warhead mass to missile mass versus the missile’s range. Graph from IISS report, p. 17. The interesting thing to take away from the plot is how the mass of the booster increases with the missile’s range. The plot shows that for a 300-km range missile like the Scud, the mass of the missile booster is only 5 times the mass of the warhead. So a 1-ton warhead requires a 5-ton missile. But to reach 7,000 km, the mass of the missile booster would be 100 times the warhead mass, so a 1-ton warhead would require a 100-ton booster. 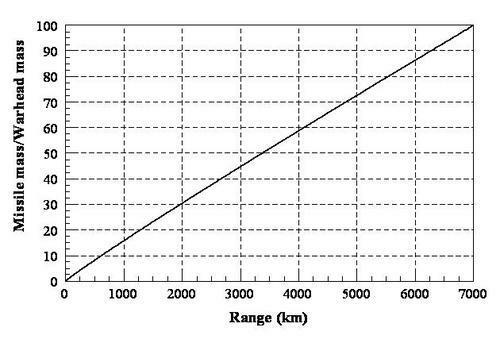 This can be seen more clearly by re-plotting the line in the IISS graph, but plotting missile mass over warhead mass and using linear axes (see below). This quantity increases very nearly linearly with the range of the missile. This means that for a fixed warhead mass, to increase the range of the missile by some factor you must increase the mass of the missile booster by the same factor. The reason for this trend is that the primary way to increase the range of a missile is to make it larger and add propellant. (Changing to a more energetic propellant or reducing the weight of the missile structure will increase the range somewhat, but a large increase in range will require additional propellant.) The additional propellant and missile structure increase the missile’s mass. As a result, the engines need to accelerate all this additional mass as well as the original mass of the missile and payload, so the increase in missile size gives you much less increase in range than you might expect. What this plot shows is that this penalty becomes very significant as you go to longer ranges. These plots assume a single-stage booster; you can do somewhat better than this by staging. But the trend is right: a 3-stage missile capable of carrying a 1-ton payload 10,000 km would still have a mass of 80-90 tons.